Anyway, I’m back today and focusing on some more eco-friendly beauty. Specifically, the konjac sponge. Last year I tried a konjac sponge made for the face, with mixed results. I love the environmentally friendly approach towards making these sponges (they’re all biodegradable) but the face sponge didn’t work with the skincare products I normally use (balm cleansers and my acne cream). But I don’t use acne cream or balm cleansers on my body, so I decided to try out the Konjac Sponge Co’s Pink Clay Body Sponge* (v) to see if that made a difference. A konjac sponge is made from natural vegetable fibre and is biodegradable. It’s also free from chemicals, colouring, additives and irritants. This particular sponge is enriched with pink clay, which is said to soften skin and leave it looking rejuvenated, while the net structure of the sponge massages your skin more than the average sponge would. I wanted to try it in place of the plastic shower puffs I normally use. 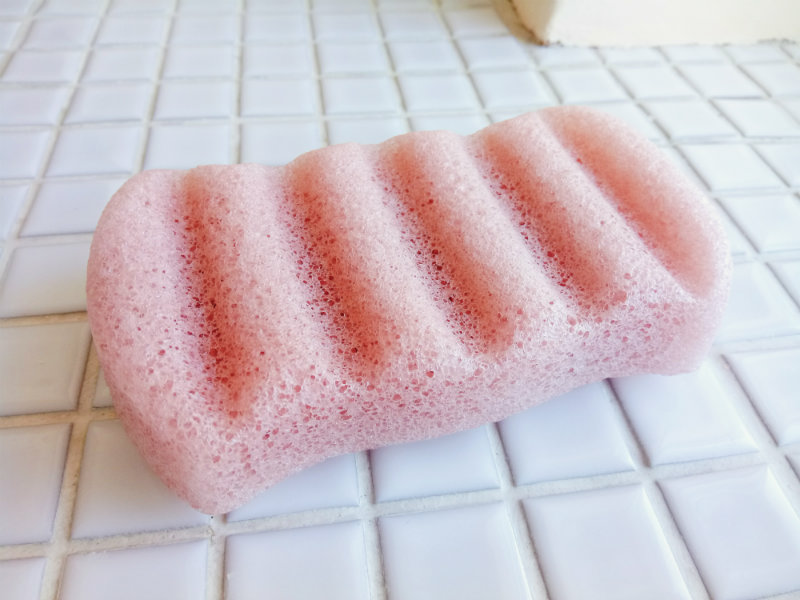 The sponge arrives completely dried out and goes back to this form when it’s not around water, so it’s important to rinse the sponge thoroughly before use. Once it’s wet you just use it to wash your body as you would normally. You can use a konjac sponge with or without shower gel — I prefer to use it with. Although the Konjac Sponge Co say your skin will feel completely clean if you use the sponge alone, my skin always feels more refreshed when I’ve used a drop of shower gel (and I like being able to smell its scent, too). However, if you have sensitive skin and find most shower products too harsh then this could be a really good option. Once you’re done you rinse the sponge of any product and leave it to dry. If you leave it in a wet environment it’ll biodegrade quicker, as I discovered on days when I forgot to move it from the bathroom. The konjac sponge feels so much nicer than a shower puff! It’s very gentle and my skin did feel softer after three months of using it every day, although you still need a body scrub for any particularly flaky patches. Possibly. As an eco-friendly shower puff alternative the konjac sponge fits the bill perfectly, and with proper care it lasts at least three months. However, £11.99 is a lot when you can get a standard shower puff for a couple of quid, so I’d have to have a substantial amount of spare cash before I made the purchase. Have you ever used a konjac sponge before? Is it something you would try? Let me know in the comments!